We are excited to announce that Cerys Matthews MBE will be hosting On Mass 2017. Cerys is a DJ on BBC World Service and BBC Radio 6 Music, where she programmes and hosts an award winning weekly show. She was a member of multi-million selling band, Catatonia and has since founded a festival celebrating culture and the natural world: The Good Life Experience. Following the success of On Mass 2015 with Jamie Cullum, the ultimate mass music making spectacle is back, but with a twist. 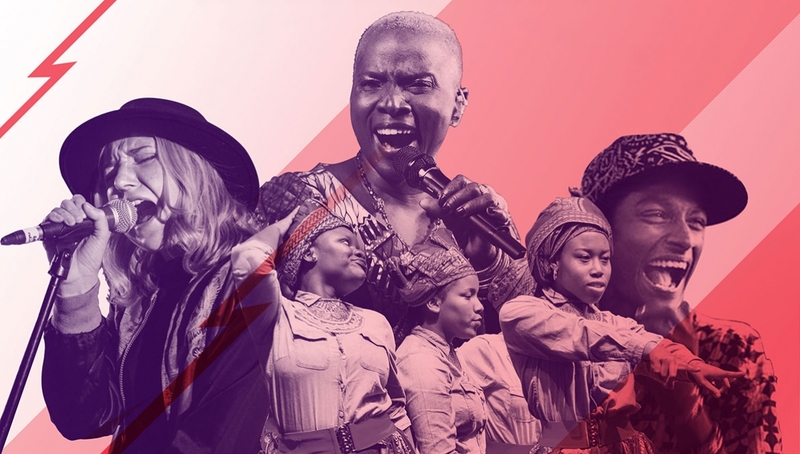 This year 180 young musicians and circus performers from across the globe will take over the Roundhouse and perform with three-time Grammy award winner and global artist Angelique Kidjo. Part of the EFG London Jazz Festival, On Mass 2017 will showcase the incredible sounds of a range of emerging artists including; London’s top carnival band Kinetika Bloco, Roundhouse Choir, Roundhouse Music Collective and Roundhouse Audio Collectives, Breakin’ Convention (Sadler’s Wells), Battersea Art Centre’s Beat Box Academy and the Roundhouse Street Circus Collective, as well as incredible musicians and performers from as far and wide as the Faroe Islands, Palestine, India and Brazil. Coined as “Africa’s premier diva” by Time Magazine, Angelique Kidjo is one of the greatest artists in international music today. With thirteen albums to her name, listed by the BBC as one of the continent’s 50 most iconic figures and deemed one of The Guardian’s Top 100 Most Inspiring Women in the World, she is a force to be reckoned with. On Mass will be live streamed to a global audience. The project was born out of the Roundhouse International Programme which was established to platform the talents of young artists and to encourage collaborations between established and emerging artists around the world. A handful of tickets are available at just £5 each for GET IN. Already a member? Log in first then hit the button below.